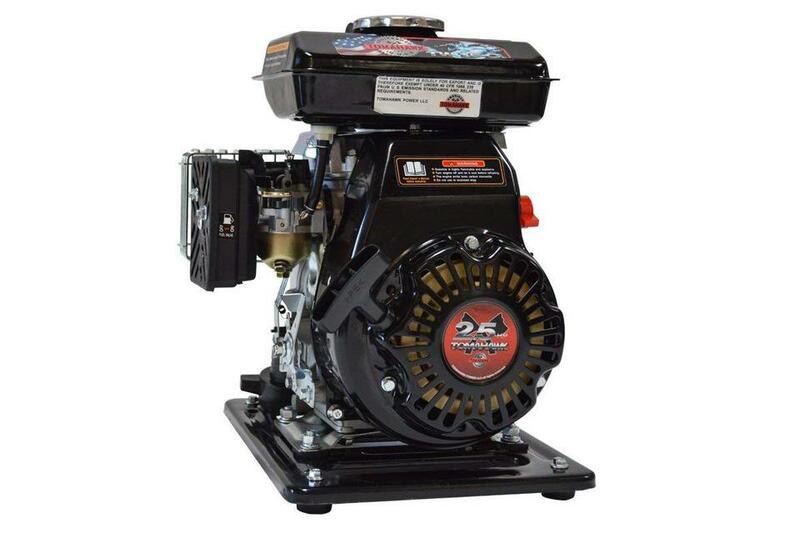 The Tomahawk 2.5 HP is a Multi-Purpose Water Pump designed to work for a variety of purposes and with a wide variety of equipment. Featuring a powerful 97cc commercial grade engine, it is extremely quiet and dependable for the toughest conditions. Eengine has a throttle to adjust engine speed and water flow. Pump comes with 2 nozzle fittings to attach an intake and discharge hoses. Made to handle a bulk amount of fluids, the TW1.5 is especially suited for gold mining. It will move water at an incredible rate of 53 gallons per minute with a maximum pump head of 33 feet. Its aluminum impeller and cast iron volute helps to reduce vibration and wear on the mechanical seal and engine, while extending pump life. Thanks to a 1.5” x 1.5” inlet/outlet, moving huge volumes of water just got easier! This motor is great on gas, light weight, and easy to transport. • Diameter of Input/Output: 1.5 x 1.5 in. • Fuel Consumption: 0.2 Gal./hr. • Net Weight: 27 lbs. • Gross Weight: 29 lbs.